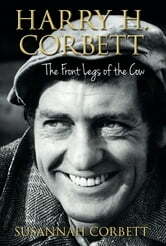 Harry H. Corbett rose from the slums of Manchester to become one of the best-known television stars of the 20th century. Having left home as a 17-year-old Royal Marine during the Second World War, he fought in the North Atlantic and the jungles of the Pacific and witnessed first-hand the devastation wrought by the Hiroshima bomb. On his return home he wandered into the local theatre company and landed a starring role – The Front Legs of the Cow. Soon becoming a leading light in Joan Littlewood’s Theatre Workshop and a widely-respected classical stage actor, his life was changed forever by the television comedy Steptoe and Son. Overnight he became a household name as the series drew unparalleled viewing figures of over 28 million, with fans ranging from the working classes to the Royal Family. Naturally shy and a committed socialist, fame and fortune didn’t sit easily on his shoulders, and for the next twenty years, until his untimely death at the age of only 57, he had to learn how to be ‘’Arold’. Written by his daughter, Susannah Corbett, an actor herself, this is the first biography of Harry H. Corbett, the man who was once described as being ‘the English Marlon Brando’.